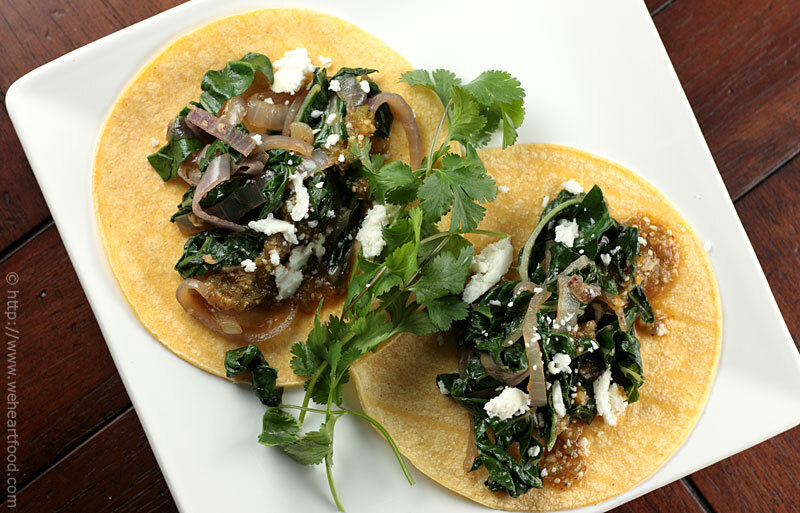 These delicious tacos from Mexican Everyday are filled with a mixture of caramelized onions and sauteed green chard — definitely a departure from the norm for us! When we make tacos at home, we’re more likely to fill them with mahi-mahi or shredded chicken. We picked this recipe because it’s Vegetarian Week here at We [Heart] Food, but these were good enough that they’re likely to make an appearance in the usual rotation. Cut chard crosswise into 1/2″ slices. In a very large (12-inch) skillet, heat oil over medium-high heat until hot. Add onion and cook, stirring frequently, until golden brown but still crunchy, about 4 to 5 minutes. Add garlic and red pepper flakes and stir for a few seconds, until aromatic, then add water, 1/2 tsp salt and the chard. Reduce heat to medium-low, cover pan, and cook until chard is almost tender, about 5 minutes. Uncover pan, increase heat to medium-high and cook, stirring continually, until mixture is nearly dry. Taste and season with additional salt if necessary. Serve in warm tortillas, topped with cheese, cilantro, and salsa. Makes about 8 tacos, depending on how full you like ‘em.